After sorting through photographs last night I was lucky to find little Evelyn Bennett pictured here with mother Loretta Bennett. Mrs. Bennett clutches a pair of eye glasses with white gloves while Evelyn sits on what appears to be a rock on the beach. Based on census records Evelyn was 2 years old in 1910, my guess is she's 5-6 years old here. 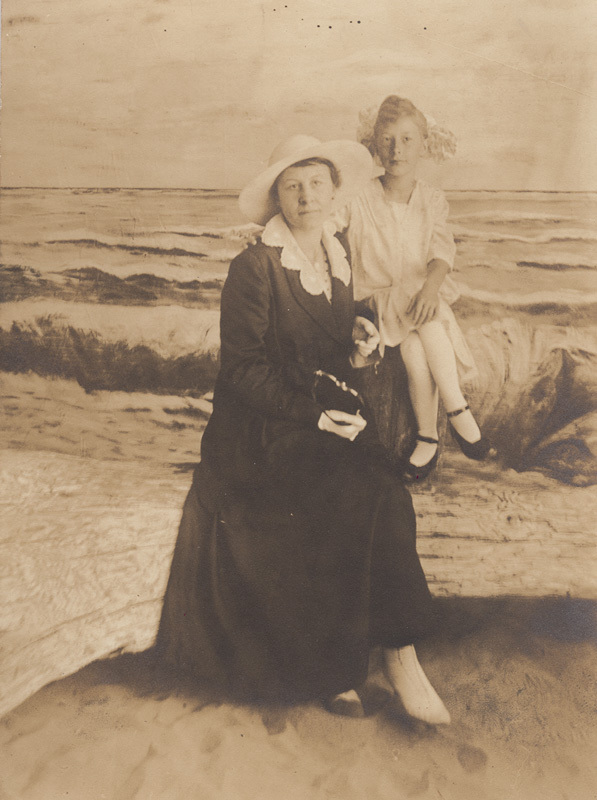 Mrs. Loretta Bennett and daughter Evelyn Bennett, (1915-16). Backside of postcard with handwritten note; Mrs. Bennett & Evelyn. Little Evelyn Bennett and Harold Martin. The picture couldn't be a better example of a wistful affection for the past. The dress style, sepia tones and light exposure, crystalize the intrinsic nature of everyday life in early century logging communities. These two young children surely witnessed one of our regions most prolific industrially inflicted catastrophes. Based on historical accounts, many children in the logging communities went on to be naturalists and conservationists, including E. H. Pearson. Perhaps at some point, we'll know more about the adult lives of these two, for now it's a mystery.